For a number of French commentators writing in the 19th century, this print represented the swansong of a civilised form of elite social life that had existed under the ancien régime. Debucourt conjures up a vivacious and acutely observed, if somewhat caricatured, portrait of 18th-century Parisian high society, delineating its character types, manners and costumes with witty affection. Yet at the time of the print’s publication, the French Revolution had been swelling for three years: in September 1792 the Republic was declared; in January the following year King Louis XVI was executed on the guillotine, and the country plunged into the violence of the Reign of Terror under Robespierre. 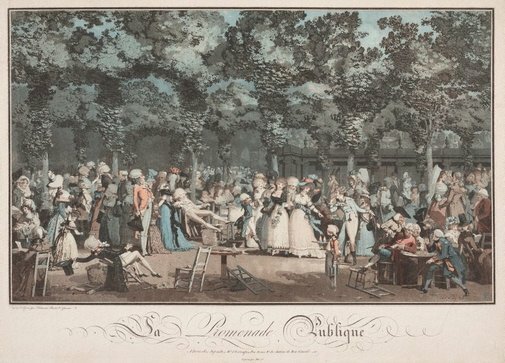 Despite the background of events, Debucourt shows members of the beau monde in all their exquisite finery, gossiping and parading under chestnut trees, blithely unaware of the unhappy fate that would soon befall them. Or is there perhaps an intimation of societal collapse suggested by the giddy young aristocrat in the left foreground, whose chair is breaking beneath him? The setting is the shady gardens of the Palais-Royal, one of the focal points of fashionable social life in Paris. The palace was owned by the duc d’Orléans, who built a pleasure garden in the centre of the palace enclave in the 1780s and opened it to the public, allowing boutiques, cafés and refreshment kiosks to operate there. While the well-heeled congregated in the gardens, prostitutes and other shady characters clustered in the surrounding arcades, which the police were barred from entering. In their long rhapsodising about this print, the de Goncourt brothers described the scene as a ‘seraglio unleashed’; certainly there is an air of playful debauchery among the social whirl portrayed here, and one senses Debucourt’s delight in caricaturing the flirtatious gestures and coquettish mannerisms of this glittering set. Among the personalities known to have frequented the gardens was the young duc de Chartres (the future King Louis Philippe), traditionally identified in this print as the figure standing in a foppish pose and blowing a kiss with his fingers. He is more or less directly behind the waiter boy in the foreground who serves ice cream on a silver platter. Debucourt was the last and greatest exponent of colour printmaking in the 18th century, and his works provide a splendid chronicle of life in the period between 1785 and 1800. The technique he perfected had been developed in Paris in the 1770s whereby the image was built up from separate plates for each colour. The aim of colour printmaking was to emulate the effects of gouaches and watercolours, hence the term ‘wash-manner’ by which such prints are also known. To create the seamlessly blended effects displayed in The public promenade, Debucourt employed a combination of different techniques in preparing the numerous plates: these include aquatint, engraving etching and mezzotint, but they are very difficult to identify individually. When the five colour plates were completed (blue, carmine, dark pink, yellow, black), great skill was then required on the part of the printer to ensure correct registration of the image. Making colour prints was a very complicated and laborious business, and although they were highly prized in the second half of the 18th century – usually framed and displayed as decorative furnishing pictures – there was little demand for such luxury goods after the Revolution. Signed and dated l.r, incised on plate "D.B.92.". Prints & drawings Europe 1500-1900 , Sydney, 2014, p 102, col illus p 103. Unknown, L’Art du XVIIIe siècle , Debucourt, p 181-215, 1910, vol III. Unknown, Graveurs français de la seconde moitié du XVIIIe siècle. XVIIIe exposition de la Collection Edmond de Rothschild , 1985, pp 112-13, illus.